These knives are supreme quality. The handles are spectacular and made from amazing material. The blades are 440 stainless steel and are razor sharp to the touch. These knives are also full tang and very strong. The sheaths are leather and have a great aesthetic flare. 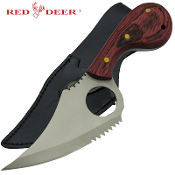 Obtain your fine Red Deer knives today.